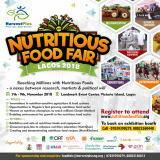 HarvestPlus conceived the Nutritious Food Fair (NFF) as an umbrella advocacy and enterprise platform to drive the production, marketing and consumption of nutritious foods in Nigeria. The Food Fair has as primary objective to strengthen public and private sector partnerships to increase and sustain the production and consumption of more nutritious foods, promote and encourage investment in the nutritious food sector and stimulate government’s policy support for nutrition interventions. It was fine, good and I really appreciate it because I gain something at the event.